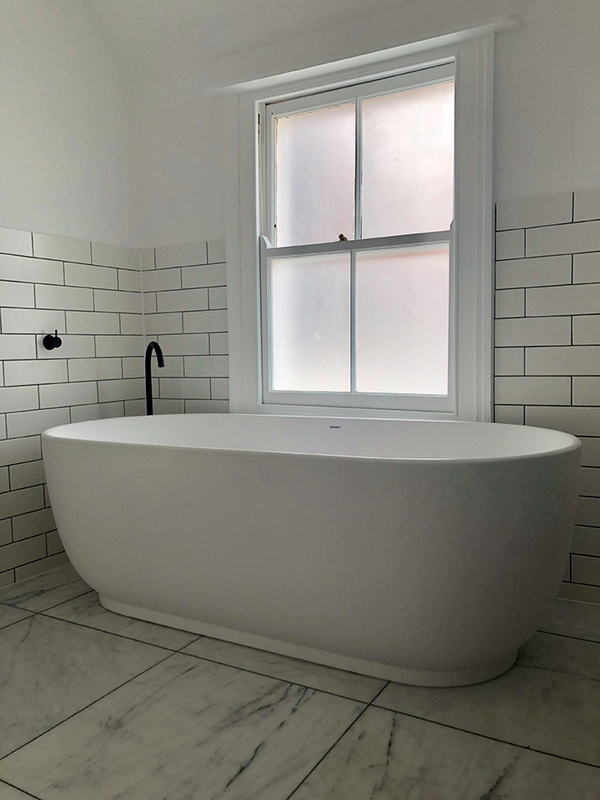 The existing bathroom was around 8 years old, but the shower leaked & the bath took ages to fill & the bath filling valve was broken. There was also a lack of storage space in the room & the lighting was poor. 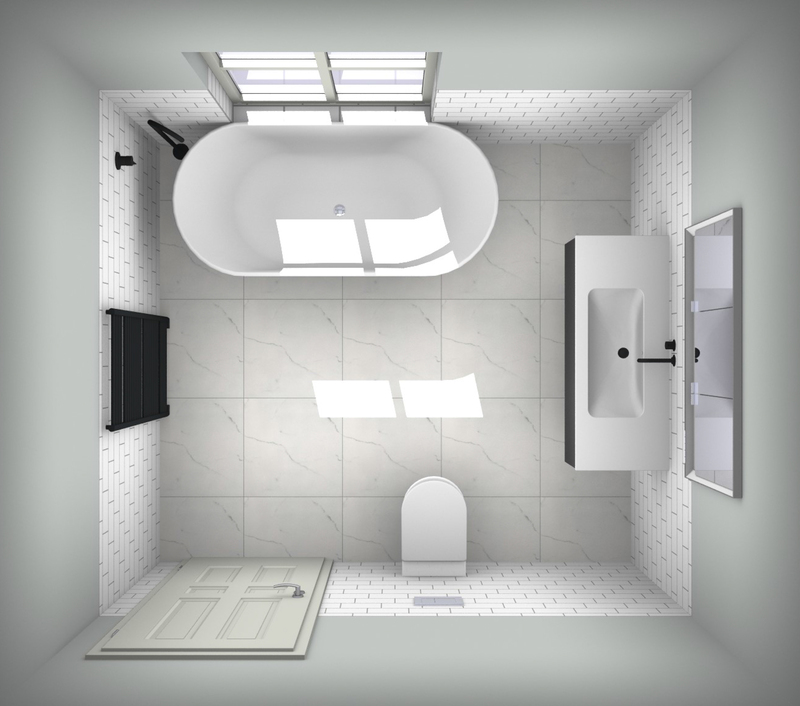 The client did not want to keep the shower & wanted the room to be very minimal. 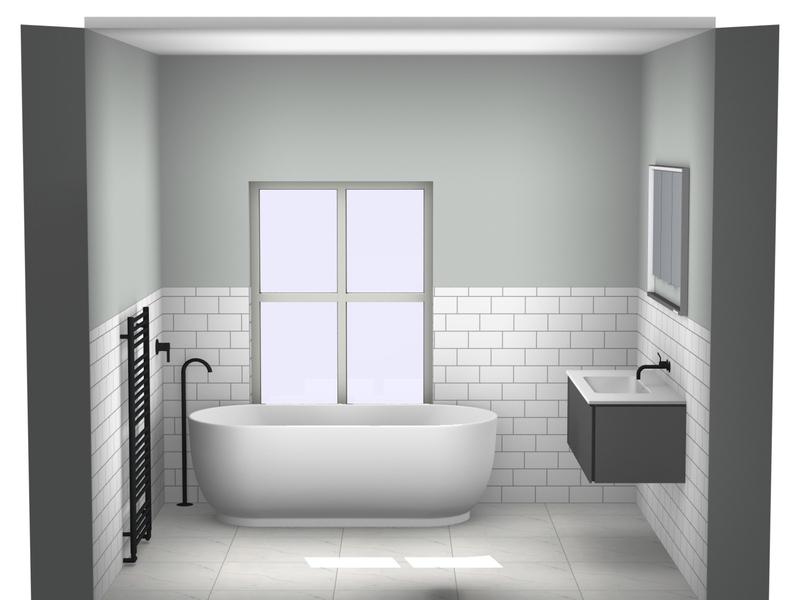 We suggested that a Scandinavian style may help to modernise the room, whilst also keeping the design simple. The client also wanted a certain element of classic design incorporated in the room, to reflect the Georgian property. 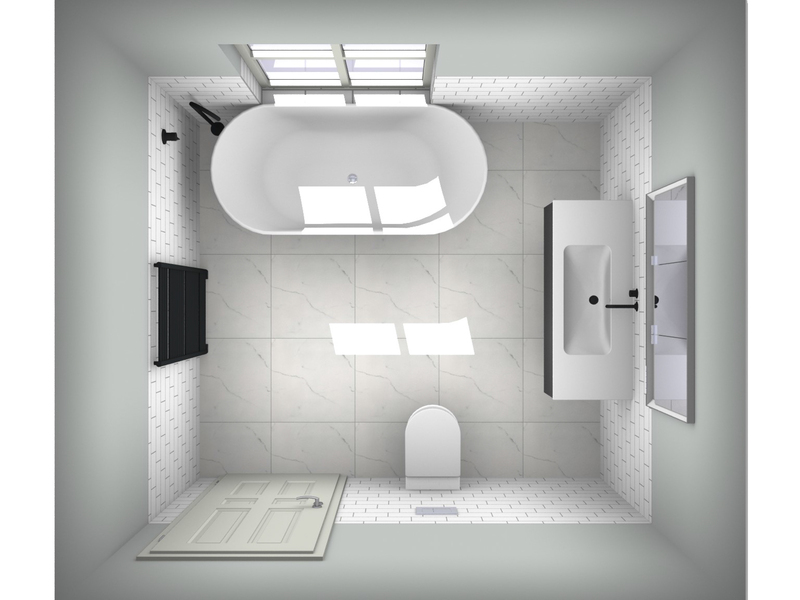 As with any project, we completed a technical survey of the room & started with a provisional layout design. We also produced a 1st stage mood board with some design & finish ideas for the client to see. 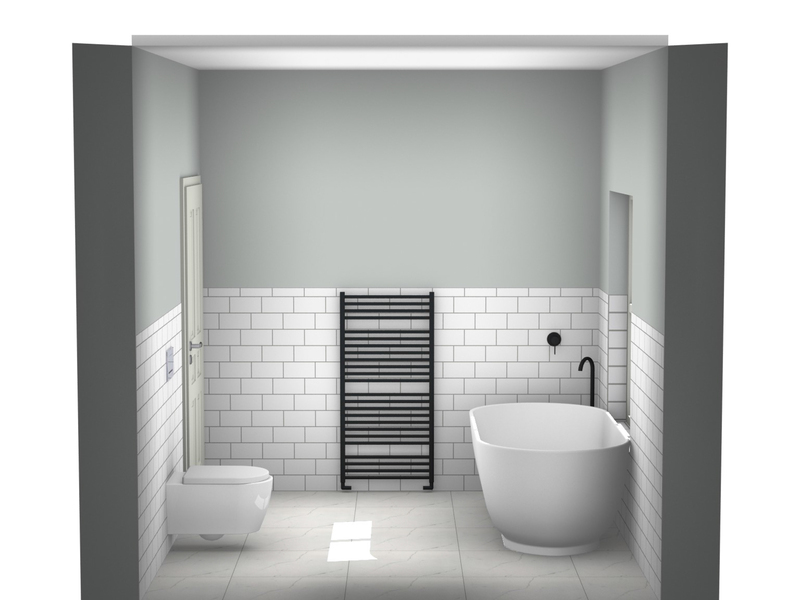 We decided early on that we wanted to use the large Duravit LUV freestanding bath, in its matt white solid core material. 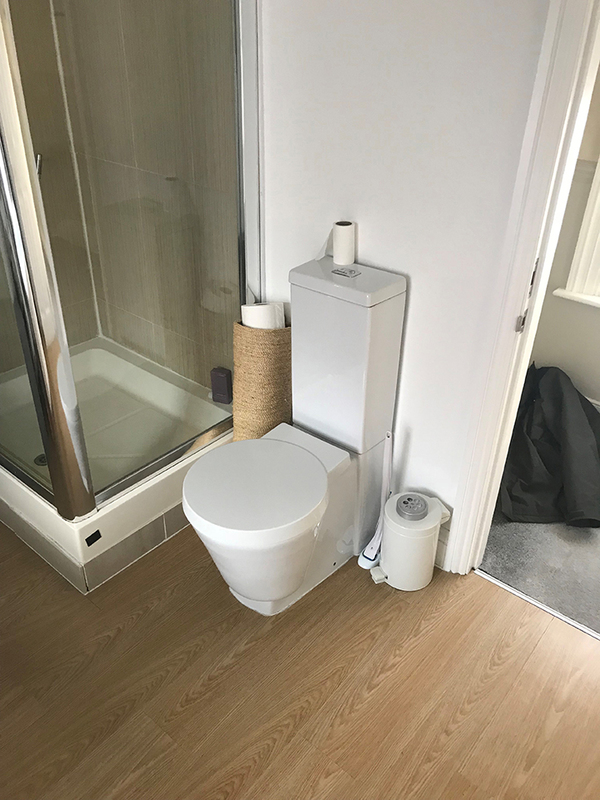 The existing toilet was very bulky by the side of the door & due to the existing plumbing, we could not re-locate it. Therefore we “hid” a mounting frame & cistern in the stud wall & used a wall mounted toilet. to reflect the heritage of a Georgian property. We also built a false wall in front of the new basin position, in order to install a recessed mirror cabinet & hide all the basin plumbing. 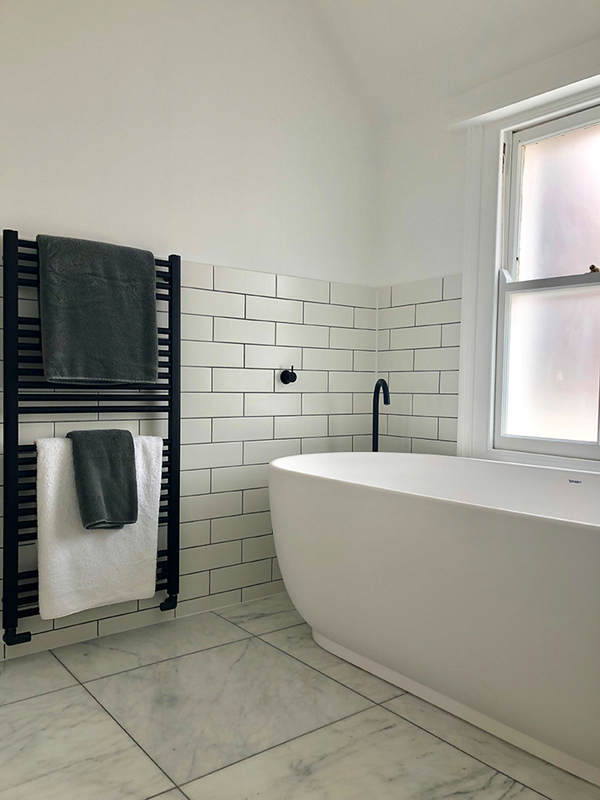 To keep with the “Scandi” design, we used a flat matt white metro wall tile, but used a Carrera marble floor tile to tie in with a more classic look. 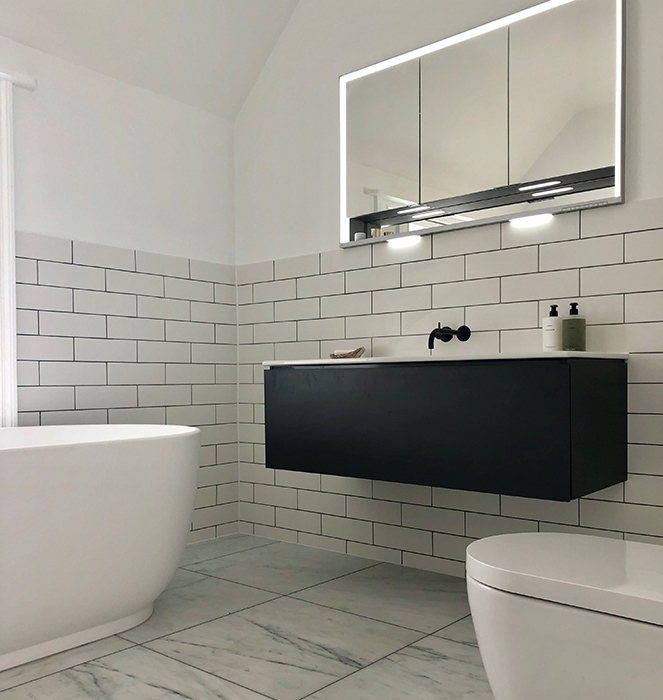 A matt black wall mounted basin mixer & floor standing bath spout from Danish manufacturer Vola, complimented the Scandi feel. 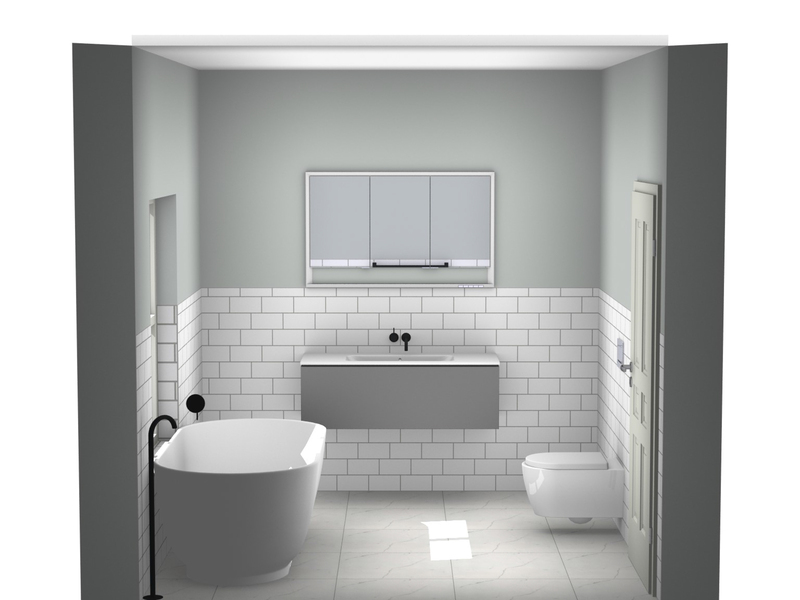 We also tied in our black, grey & white theme by using a dark grey tile grout & a Duravit anthracite vanity unit. Overall the room took around 3 weeks to complete from start to finish. 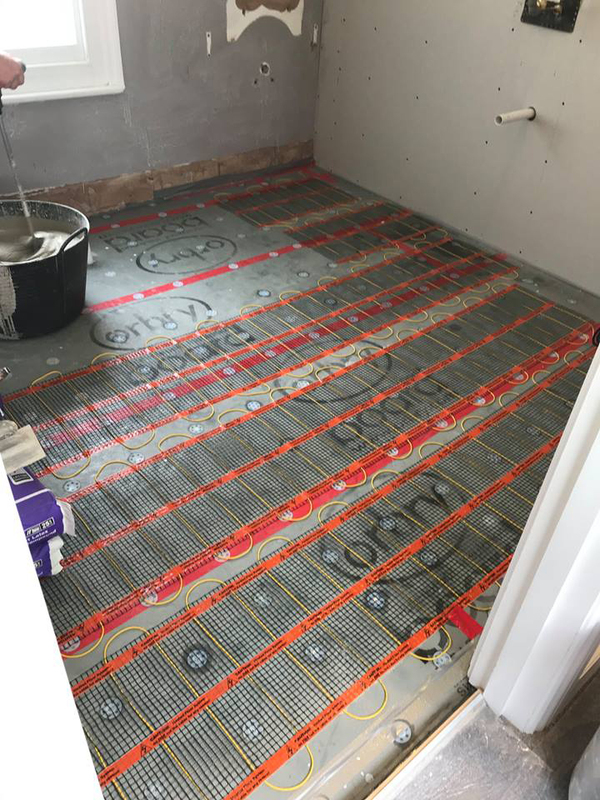 There was a great deal of existing redundant plumbing that had to be sorted under the floor & the existing floor had to be replaced. 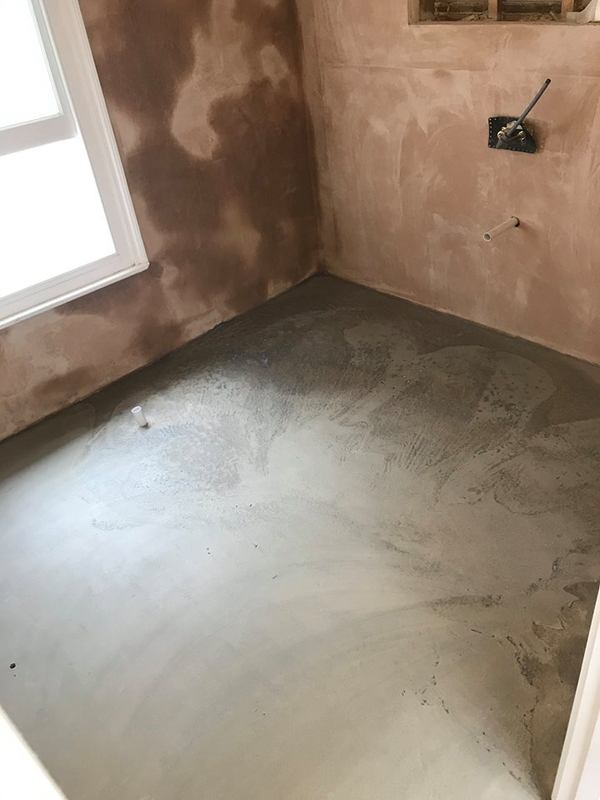 We re-plastered & decorated the of the whole room & new lighting was installed as well as electric under-floor heating for comfort. 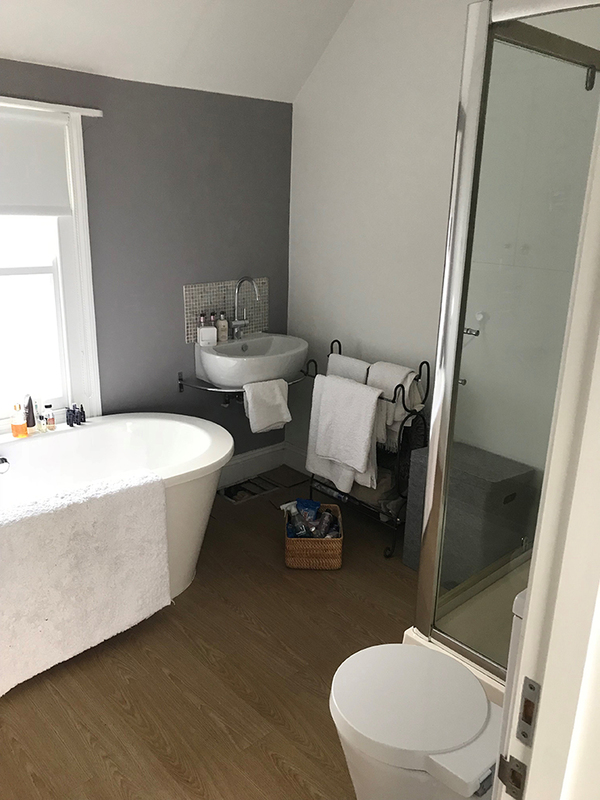 “We employed the services of the Hove Bathroom & Kitchen Centre to replace an old and tired bathroom in our house. HBKC had been recommended to us by someone whose opinion we trusted. From our first consultation with James Houldcroft at their showroom we had a sense that we were in capable hands. 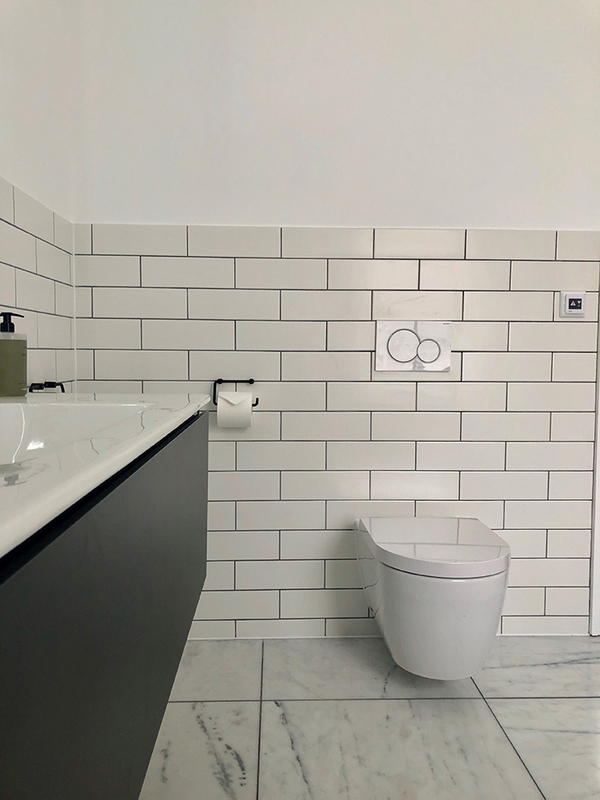 Before this we had used our building firm to create a couple of bathrooms for us but much like visiting a consultant rather than a GP, HBKC made us feel that they would be in charge of the refit from beginning to end, including project management. This is their area of expertise! After James visited our property he quickly came up with a plan which fell within our budget. 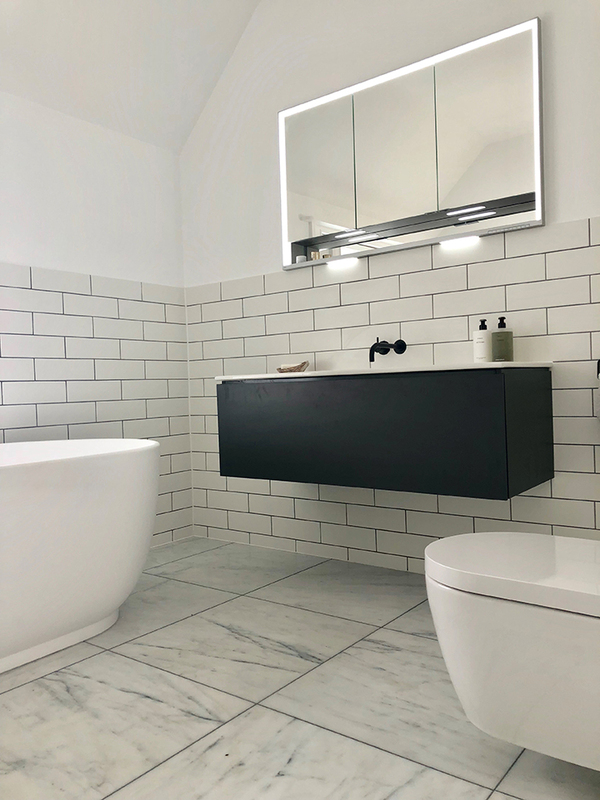 We were so pleased with the first plan that the only tweaks we needed to make were to the style of taps and tiling and a change to the type of basin. 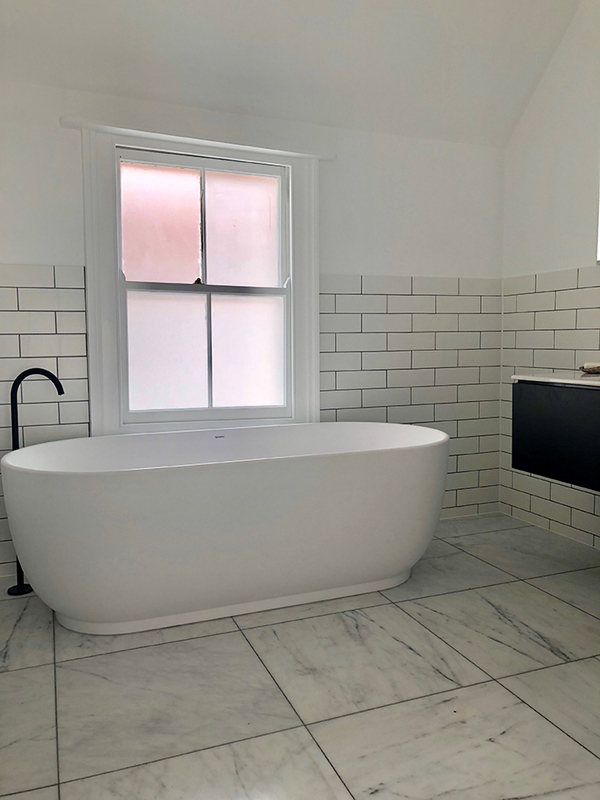 The bathroom was installed by one of their expert bathroom fitting teams, Tommy & Callum. Tommy was excellent: on time, professional, clean and tidy, honest (when we wanted to make some changes during the fit) and a perfectionist. James oversaw & managed the whole project from beginning to end, with regular visits to our property.